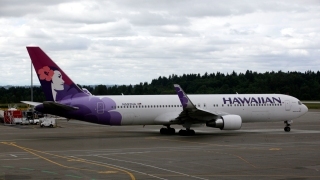 A Hawaiian Airlines flight from San Diego to Maui diverted to Oakland, California, due to an engine problem and landed safely. Airline spokesman Alex DaSilva says flight HA37 departed San Diego International Airport at 8:25 a.m. Monday and was bound for Kahului Airport when a cockpit light indicated a possible issue with one of the jet's two engines. DaSilva says that out of an abundance of caution the pilot diverted the Airbus A321neo to Oakland International Airport and declared an emergency to obtain priority handling. The aircraft landed at 10:51 a.m. and the 178 passengers and seven crewmembers deplaned. A new departure time is being determined.